The Fugard Theater and Eric Abraham (the publisher of the book) present the play, A Human Being Died That Night at the Brooklyn Academy of Music. It is based on the book by Pumla Gobodo-Madikizela. The play was written by Nicholas Wright and directed by Jonathan Munby.This play is an excerpt of forty hours of conversation between Madikezela, a psychologist, and Eugene de Kock, a convicted murderer, at Pretoria Central Prison during the apartheid era in South Africa. In this play, based on a true account of notorious killings in Pretoria, South Africa, Madikizela is played by Noma Dumezweni and de Kock is played by Matthew Marsh. It is primarily a two person show. In apartheid South Africa, the police were responsible for a covert counter-insurgency operation in which many black South Africans were killed by the police. The most notorious assassin was Eugene de Kock, nicknamed “Prime Evil”. de Kock was convicted of one hundred and twenty-one charges including nine murders. He was sentenced to two hundred and twelve years and two life sentences for his many crimes. He is still waiting for some of his accomplices who were never charged to accept the blame for their actions. Madikezela tells him that “When guilt is shared, it is hard for anyone person to feel the weight of it.” South Africa had previously abolished the death penalty, but de Kock applied for a pardon over a decade ago, and in January of this year he was granted parole. After the nullification of apartheid and the election of President Mandela, the Truth and Reconciliation Committee was promulgated to hold accountable those who were responsible for the assassinations of innocent South Africans. Madikizela was part of the committee. She visited de Kock and recorded their conversations to try to understand what happened during his reign of terror and to forgive him for his horrific acts. This theatrical performance is condensed to one hour and twenty minutes. Because the play is based on a series of authentic prison interviews, the play takes place in a “cell” with limited movement by the characters. The audio design gives us the feeling of a prison as well as a constructed prison cell. There are very few props and the lighting is limited to light streaming on the two characters. 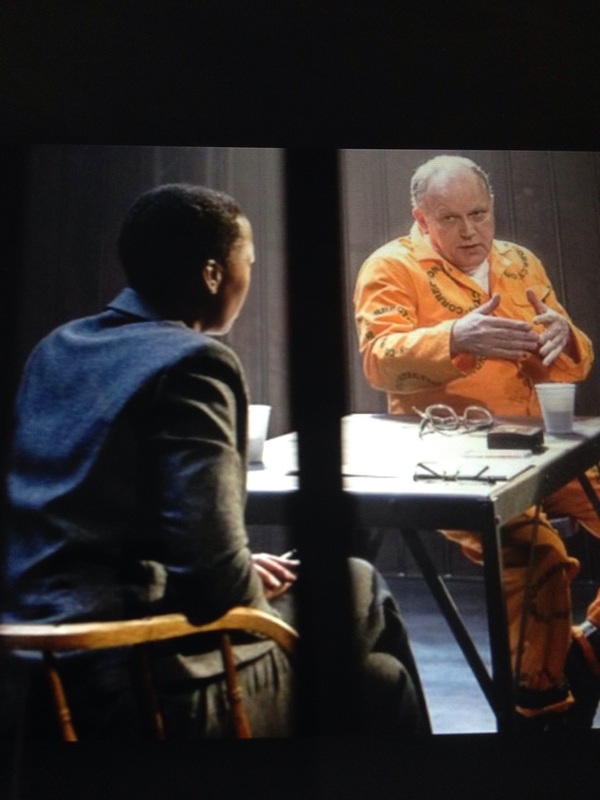 Madikezela is dressed professionally and de kock is dressed in an orange prison jumpsuit until the end of the performance when he is given privileges because of his good behavior (this shows his transformation). It flows like a theatrical documentary, but the issues that are discussed and explored are relevant for all of us, regardless of race or domicile. 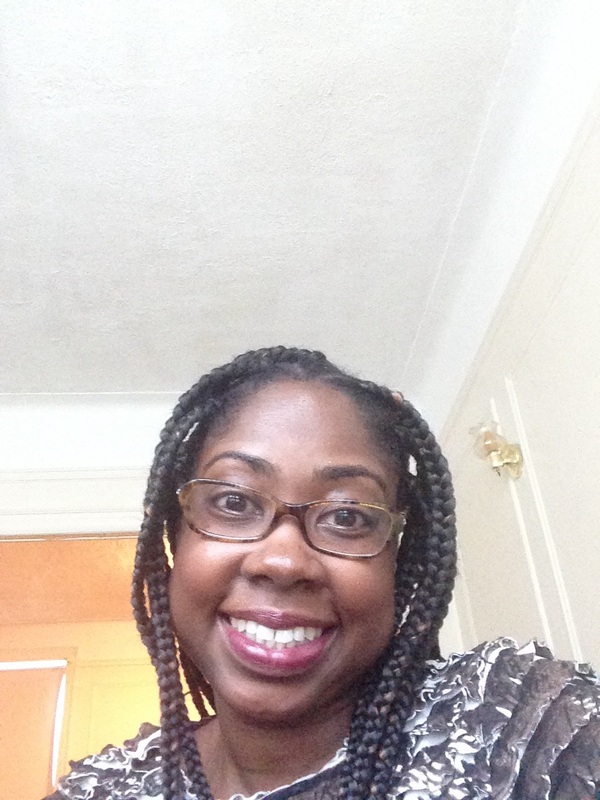 Many social issues such as AIDS, domestic violence, and women’s rights are explored, but these issues appear to be forced into the dialogue and do not flow as well as the main issues of truth and reconciliation and the causes of violent behavior (whether violence is learned or innate). Humans have both the capacity for evil and the capacity for forgiveness. In the play, Madikizela tries to understand de Kock’s point of view. Through out many hours, de Kock acknowledges the truth; he details why he murdered many black men, women, and children. Through the overwrought dialogue, we get an accurate understanding of the thoughts and intents within de Kock’s heart. Specifically, he did not see blacks as human beings, although he never considered himself a racist. According to the taped recordings, all he saw was their color, and he said that he and the other police were prepared to defend South Africa at any cost. He stated that white South Africa had to know that South Africa was being protected. They did not care how they were protected as long as they had good schools and great homes. According to him “White South Africa needed a scapegoat and black South Africa needed a culprit.” Rule by black men, according to de Kock, was the one sure way to destruction. They were prepared to save South Africa at any cost. He was encouraged by the police to “make a plan” regarding black people. Making a plan meant for him to do whatever it took to ensure the death of black South Africans. That even meant killing black police officers who crossed over to the African National Congress threatening to expose the truth. He asked the question,” Did I do wrong? Did I know it was wrong?” He saw it as ” a bunch of great guys doing a tremendous job.” I am not sure at what point, de Kock repented for his actions, but he realized that the men he killed read the same Bible that he did. That was his first glimpse that he realized they shared some similar beliefs. In spite of all the horrific acts de Kock committed, Madikizela both connects with him and forgives him. The wives of the deceased forgive him also, even though de Kock stated that he felt as if he were “doing the wives a favor” because of the belief that the husbands were unfaithful (based on stereotypes). 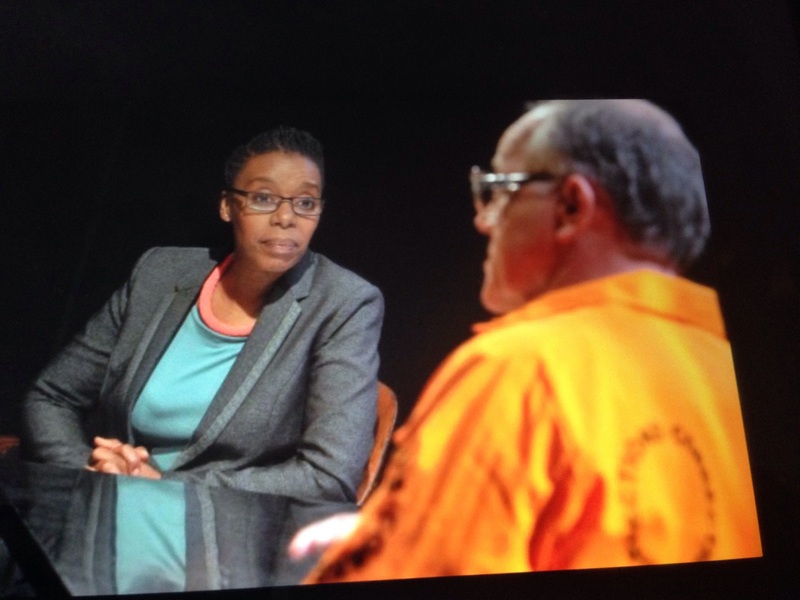 At the last interview, de Kock asks Madikizela if she personally knew anyone that he killed. He stated that he believed that she would find it hard to forgive him, if he killed someone she knew. She said that she knew none of his victims. The victims’ families had to lay down their burdens instead of continuing to carry them. Listening to the dialogue and watching the action was difficult because connecting de Kock with the murders and listening to his confession was somewhat disconnected. It was easy to see that he was a human being who needed forgiveness and that he too was a victim of the racist policies of South Africa. Everyone throughout the world has been touched by race. We cannot escape it. We, like de Kock, have to work through it and forgive each other for the wrongs that we have committed in the name of race. The play also explores possible motives and causes that lead a man to commit abhorrent acts. de Kock stated that he looked at himself as a crusader. He did not see that he was doing anything wrong. He stated that he had a typical childhood. As a child, he said, he was ridiculed for stuttering. For him, violence “was an addiction that had a short-term thrill that left him hungry for more.” He never saw himself as a racist because he said that he worked with blacks. Moreover, de Kock stated that one’s code of morality comes from “What you were taught from home.” He also stated, “I was not born evil. God would not do that to a small child.” He added, “Maybe part of my character was toward violence.” Through this performance one learns that it is easy for perpetrators to make excuses for the violence against the oppressed. No one regardless of race, social-economic status, or past history should treat anyone less than a human being. de Kock, through these intense conversations, came to the conclusion that political leaders sell their souls. He and the other police killed many, and that they fought for nothing. Madikizela comes to the conclusion that the “difference between good and evil is paper-thin.” We all have the propensity for evil and we all need forgiveness. This show is playing until June 21, 2015. Although it is dialogue heavy, the issues discussed are relevant for all of us today, whether you live in Israel, Myanmar, the United States, or South Africa. Let’s use this play to spur a conversation. I am not without my own racial prejudices, but I strive daily to lay them aside and to see people as human beings first! Comments welcome. The Education and Humanities Department at BAM asked me to assist them in curriculum development for this play. 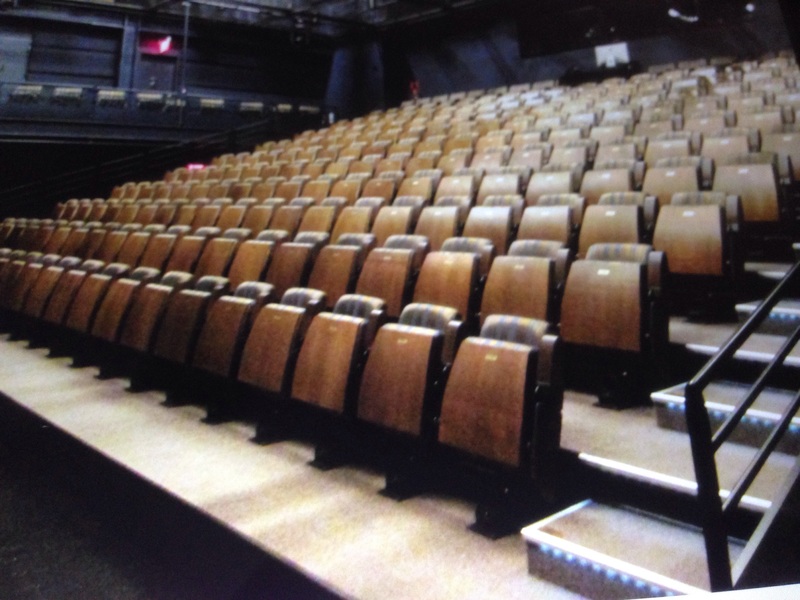 They have secured the right to film it and to show it to students at a later date. If anyone has any ideas, please feel free to share them. Thanks.